The Bay Area in winter is a magnet for migrating birds, whales, seals, and ladybugs. Winter foliage & colder temperatures make it easier to spot year round residents. CA State Parks, East Bay Regional Parks, City of Palo Alto Parks, POST, & San Mateo County Parks protect these special spots. These six best Winter Bay Area will make you feel like you’ve entered a BBC nature video. Elephant Seals, Ano Nuevo State Park, Pescadero, CA – Over 5000 seals congregate from December to March on a beach between Half Moon Bay & Santa Cruz. The males arrive in December and fight for dominance. 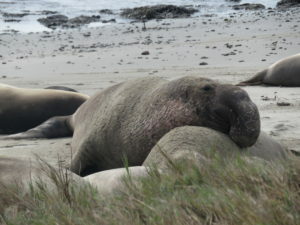 The females come ashore in January and give birth in February. In February & March, pups and weaners grow as quickly as possible. Then, the adults swim back out to sea. 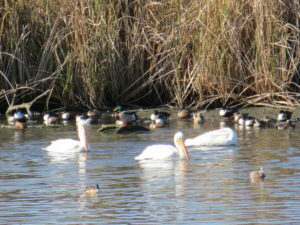 Reserve a 3 mile docent tour via www.reservecalifornia.org. 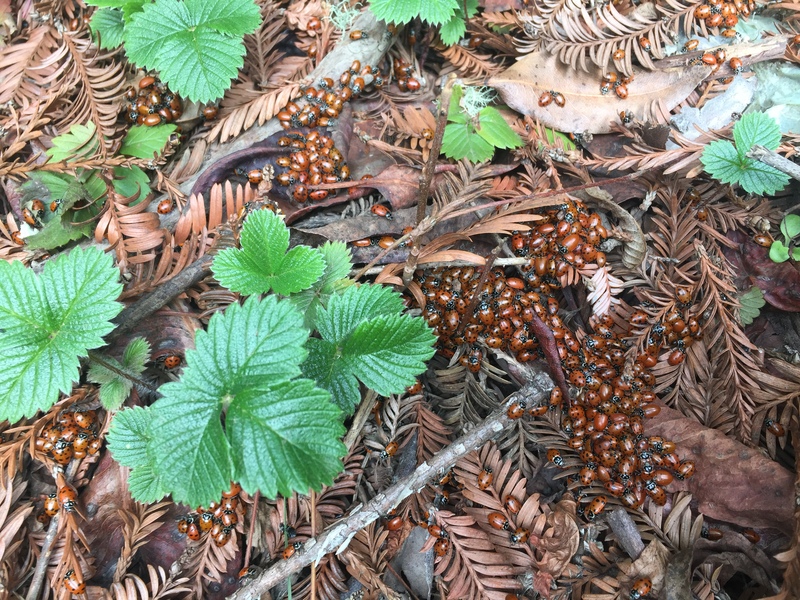 Ladybugs, Redwood Regional Park, Oakland, California – Thousands of ladybugs spend October to March in Redwood Regional Park. The ladybugs gather in warmer spots to help combat the winter temperatures. The biggest wintering spot is on the Stream Trail near the Prince Trail which is a 3 mile roundtrip hike from Skyline Gate Trailhead. Grey Whales, Devils Slide Trail, Pacifica, CA – Grey Whales swim south along the California Coast in January to give birth in the sheltered water of the Gulf of California in Mexico. Then, in March & April they swim North with young calves to the feeding grounds in Alaska. View their spouts from cliffs that jut into the Pacific Ocean. 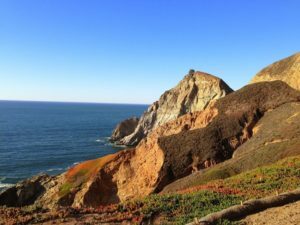 Devils Slide Trail in San Mateo County is one of the best spots to view this migration. Another excellent spot for whale spotting is Pigeon Point Lighthouse in Pescadero. 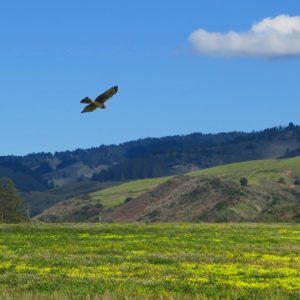 Raptors, Cowell-Purisima Trail, Half Moon Bay, CA – The Bay Area is a Pacific Flyway destination. Thousands of birds migrate from Alaska, Canada, & the Pacific Northwest. The 7.2 miles one way Cowell-Purisima Trail is an excellent spot to watch birds of prey. The open fields along the coastal cliffs make it easy to spot raptors soaring & circling for rodents. Only open on weekends, the South trailhead is easier to park and spot raptors all winter. Monarch Butterflies, Natural Bridges State Beach – Monarch Butterflies return every year to this Eucalyptus Grove. 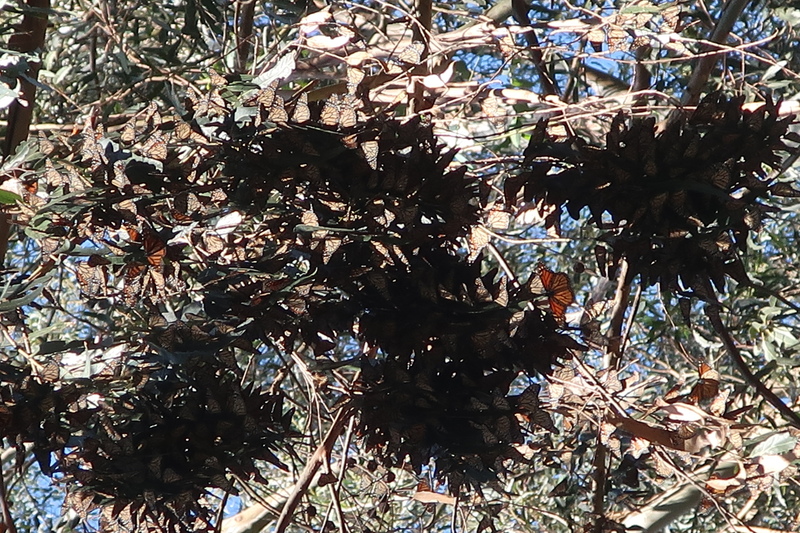 Up to 10,000 monarch butterflies winter at Natural Bridges State Park from November to January. Peak months are November and December. During chilly weather, butterflies cluster on trees looking like leaves. As the temperature warms in the afternoon, the monarchs fly around the grove. Shorebirds, Baylands Preserve, Palo Alto, CA – The marshes and rolling hills of Coyote Point provide a refuge for migrating shorebirds. The causeway near the San Antonio Blvd trailhead provides excellent viewing among tall reeds & secluded ponds. This is a great spot to watch birds all winter and the rest of the year.